Barbecuing is an under-rated method of cooking for vegetarians. People have this assumption that barbecues are meant only for burgers and hot dogs, but once the creative side of grilling comes out it’s a completely different story. I get it, burgers are great, but a little variation is nice sometimes. I’ve only ever had corn on the cob boiled, which still tastes great but it’s different from grilled. One major difference I noticed is that when you boil corn, it keeps it’s “plumpness” all around. 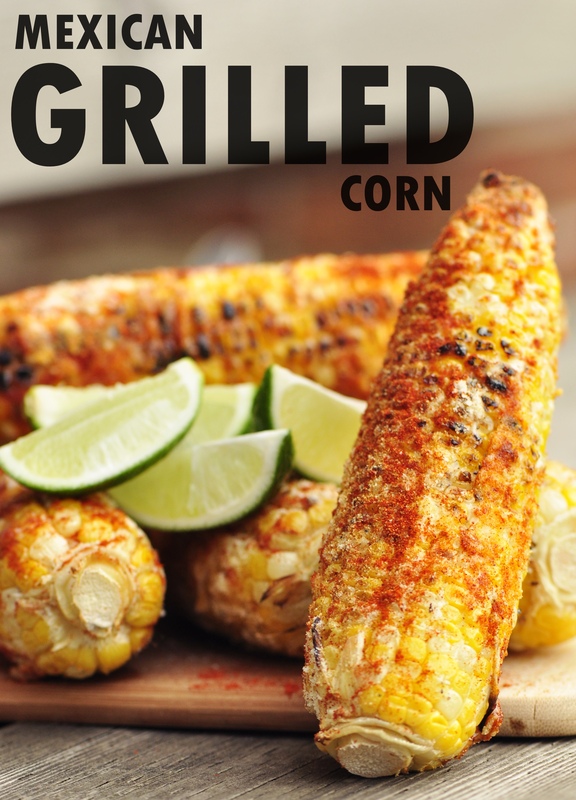 When you grill corn, some of the kernels will look sort of deflated, but when you bite it they’re still juicy. I got this recipe from Garnish With Lemon, but added garlic powder and guessed the grilling temperature (really nice photos on their post!). The spice level with cayenne pepper is really up to you—the measurements I put are more suggestions than mandatory. A little bit goes a long way! I also used parmesan cheese instead of cotija cheese. There are handles that stick in each end of a cob so you don’t get your hands as messy, but it’s 100% not necessary. I couldn’t find mine but nobody seemed to mind mucking up their hands while eating. Sidenote: If you have a big group of people, feel free to double/triple the recipe and it will work just fine. You can even set of a station where people can sprinkle their own favourite toppings onto the corn, and use a wider variety of toppings as well. I found the ones I used were basic but complimented the corn well, so I wouldn’t have used any other spices so I wouldn’t drown out the flavour. Preheat your barbecue on medium heat. In the meantime, coat corn cobs with olive oil and evenly sprinkle salt and pepper for taste. Once preheated, place the corn on the grill and cook for 12-15 minutes turning every 5 minutes or so. When finished, the corn should be lightly browned or blackened just enough for the kernels to be cooked (this will be uneven, that’s the way it’s supposed to be!). Cover each piece in the mayonnaise (as you would butter with regular corn on the cob), then sprinkle parmesan cheese, garlic powder, paprika and cayenne pepper. 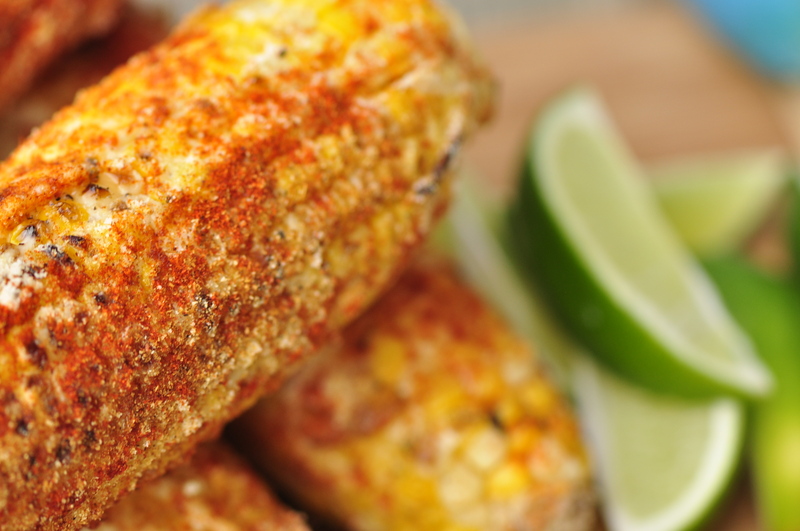 Serve with lime wedges and squeeze the juice over the corn before eating for an extra flavour blast. Thanks for the link back. And I think your pics rock! 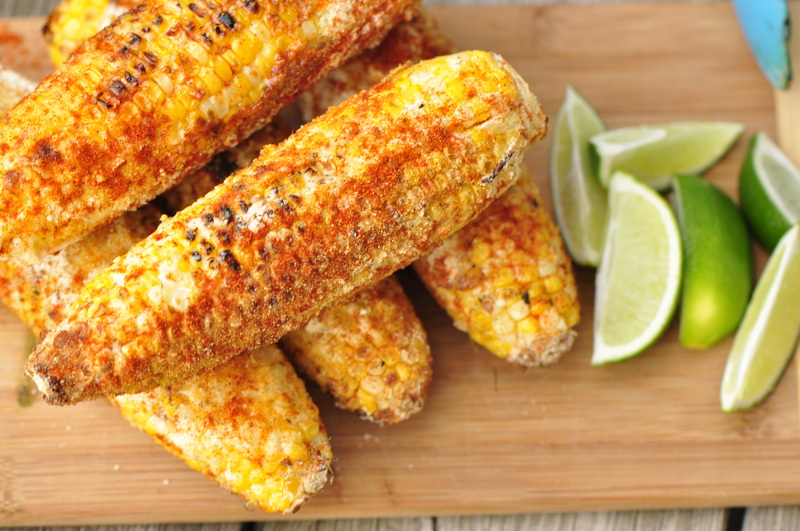 I love roasted/grilled corn – on the cob or not. It is so much more flavorful. This looks delicious. Best corn I have ever had! The lime really gives it the extra boost of flavour, a definite must! You now have me inspired for my first outdoor grill meal this summer. Of course, I may need to wait a bit for local corn, but this tasty recipe may work just fine with supermarket variety corn as well. Thanks for visiting. Sorry I’ve been somewhat absent these days. Trying to get back to blogging. Funny enough I actually made these for dinner tonight, everyone loves this recipe in my house. I use supermarket corn a lot unless I’m up at the cottage and it works just fine (local is always better but hey).